Visiting The Rock of Cashel and Hore Abbey in Ireland is a must if you are touring Ireland’s Ancient East. The drive to the Rock of Cashel from Dublin only takes around 2 hours and it’s well worth the trip. If you stay in Kilkenny the trip will only take you an hour. 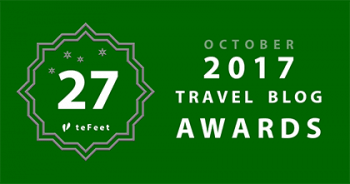 The Rock of Cashel and Hore Abbey lie in the county of Tipperary which is an absolutely stunning place to visit. 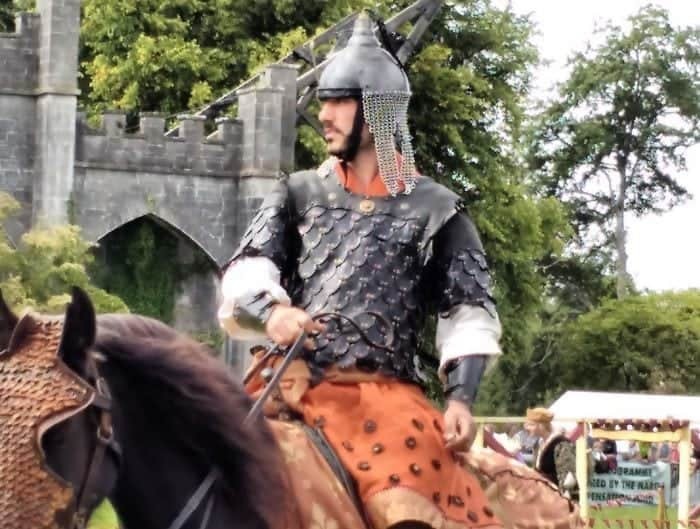 Many folks don’t bother to see Tipperary but there are so many things to enjoy about this county from its velvet rolling Galtee Mountains, to its Golden Vale. The pubs in Tipperary are amazing and it is said that the best pub in Ireland is located here – if you can find it. Want to learn How to Move to Ireland? Do you have Irish Ancestry and want to know if you can get an Irish passport? Check this. In Irish, Gaelic Tipperary translates as – Tiobraid Árann (“House of the Well of Ara”). 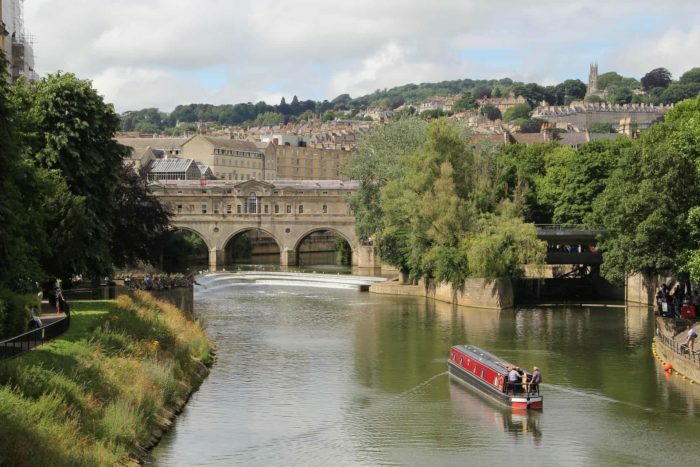 Which is a reference to the river, but no-one knows the significance of the actual well which is in Lattin (a little Village not the ancient language). Cashel is the village at the heart of Tipperary. The Rock of Cashel (Carraig Phádraig), more formally St. Patrick’s Rock, it is also known as Cashel of the Kings sits above the village and can be seen from virtually any angle. 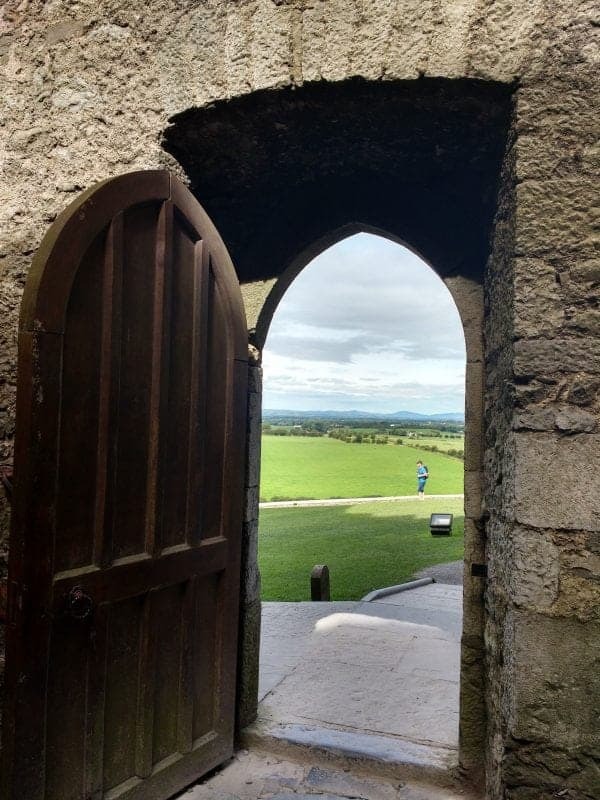 The views in Tipperary are spectacular from the Rock of Cashel, the Golden Vale is at the heart of the County and there are countless sheep and cows, not to mention the fact that this is home to some of the world’s most famous racing horses. The ‘Golden Vale’ extends from east Limerick and across south Tipperary and north Cork. Its rich grasslands are the focus of the most extensive dairy farming activity in Ireland. Tipperary also has some of the best pork raised in the country, rashers, bacon, gammon and dry-cured hams compete with fine organic turkeys, lamb and mutton. Many roads here don’t have actual names they are simply signposted as the R505 or the R6901, Google maps has been a lifesaver, unfortunately, there are still many areas with no wifi so sometimes the signal dies. We have also found that many ruins are not signed you simply screech off the road you are on in search of the ruin you spot in the distance. The Rock rises up out of the landscape as you approach it placed high on top of limestone outcrops where it oversees the fertile landscape of Tipperary. Resolute stonewalls circle a round tower, a 13th-century Gothic cathedral and an exceptional 12th-century Romanesque chapel containing some of Ireland’s oldest frescoes. 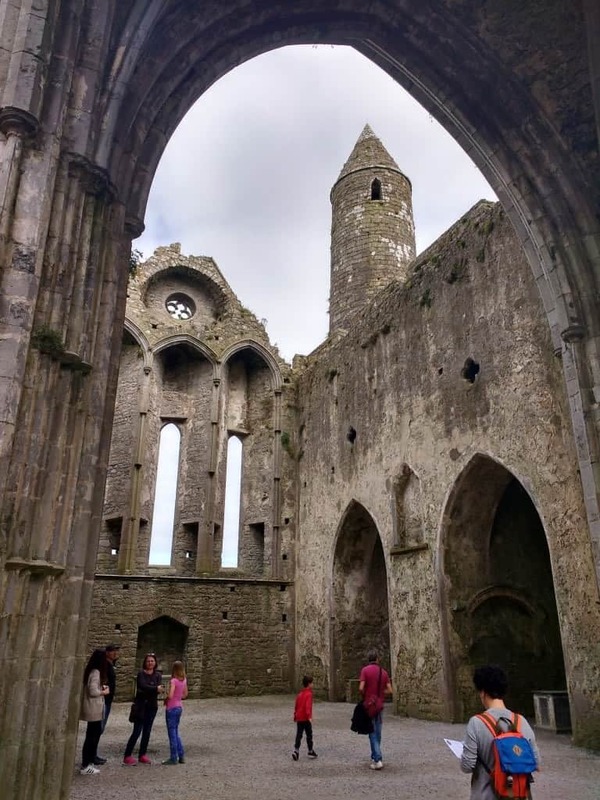 Admission to the Rock of Cashel is around 8 Euros – but here’s a tip stay in Cashel and have breakfast or lunch before going to the Rock and ask for the visitor’s voucher to get a two for one entry fee to the Rock. 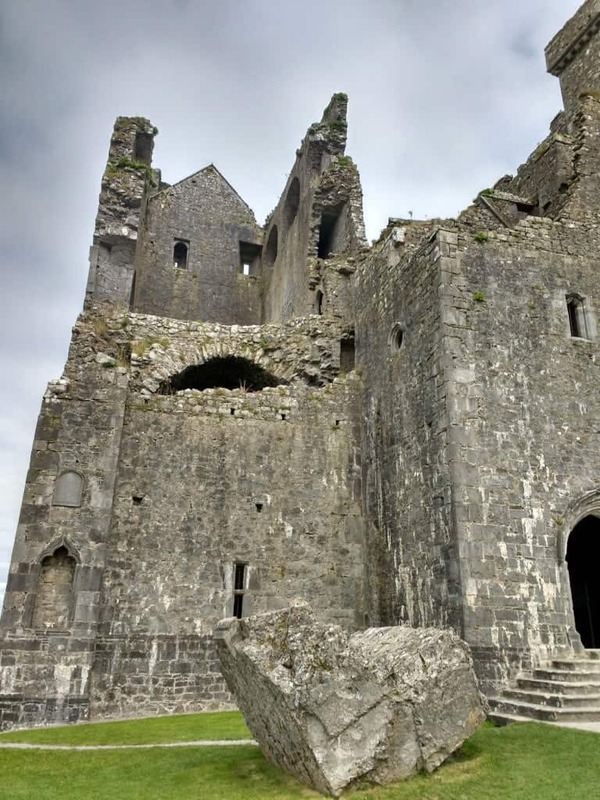 You can book tours at the Information office either in Cashel town or at the Rock of Cashel itself and audio tours are available in several languages. For disabled travellers the Rock of Cashel can be a bit tricky, the paths are gravelled and lumpy. There is disabled access through a drop-off point closer to the Rock itself but it would be a little tricky to get around in a wheelchair. There is a steep hill to walk up for those with mobility challenges but there are some rest stops and you can take your time looking around the site although sometimes the tourist crush can be very heavy. Check out the view of Hore Abbey from the top of the Rock of Cashel. Hore Abbey is easy to get to but there is no parking and it would be difficult to access if you are challenged with mobility issues. 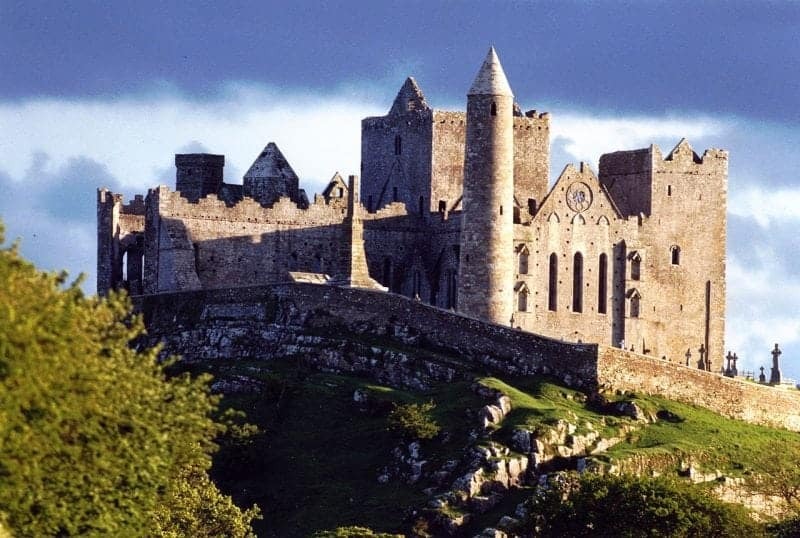 The word ‘Cashel’ is an English version of the Irish word Caiseal, meaning ‘fortress’. The Rock of Cashel is said to be the ancient royal site of the kings of Munster. In 370, King Corc built a castle on what had been known as the “Fairy Ridge” and established a capital there. 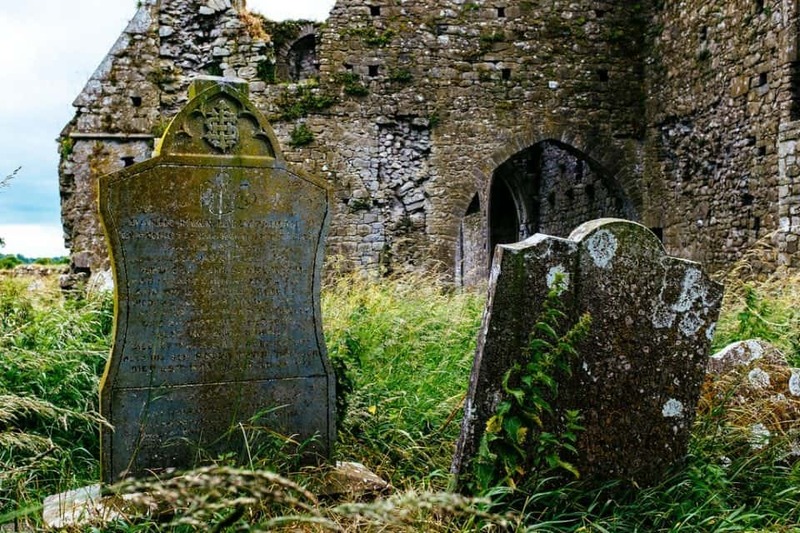 It was around 448 when St. Patrick came to Cashel to baptize King Aengus. Tradition has it that Patrick accidentally pierced the king’s foot with his staff during the ceremony. The King, thinking this was part of the ceremony, remained silent and stoic. In 1101, the Rock was gifted to the religious of Ireland by Muircheartach O’ Brian, ostensibly to keep it from ever falling back into the hands of his opposition, the McCarthys. Hore Abbey, of which there is a magnificent view from The Rock of Cashel, was founded in the 1270s by an order of Benedictines. It is hauntingly beautiful, placed in a meadow directly opposite the Rock, Hore is also known as St. Mary’s as it was dedicated to the Saint. The Abbey gets its name from the Irish translation of An Mainistir Liath (grey abbey). The name also refers to the colour of the Cistercian habit, which was a similar shade to that of hoar frost. 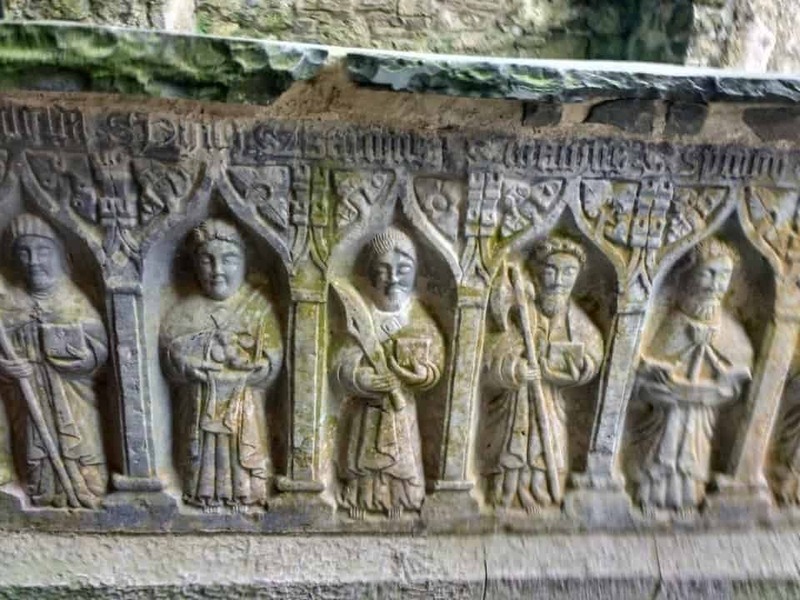 In 1269 the legend goes that Archbishop of Cashel David McCarvill had a dream that the monks attempted to decapitate him so fearing for his life – threw the Benedictines out. The Archbishop remade the abbey as a Cistercian foundation and imported monks from Mellifont Abbey to populate it. 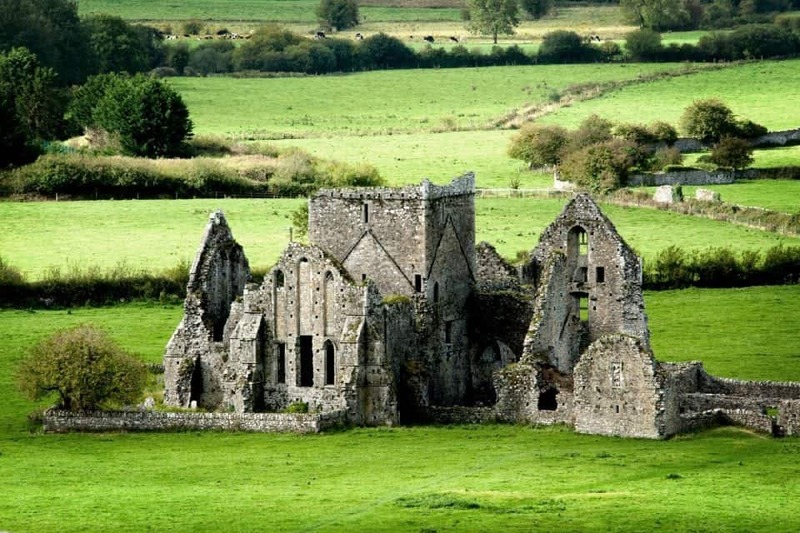 It was the last Cistercian abbey to be founded in Ireland. The majority of the ruins you see today date from the 13th century though some changes were made in the 15th century. The most obvious change was the addition of the tower in the middle of the transept. The remains of the cloister arcade are positioned to the north of the abbey itself, which is unusual. The Abbey was dissolved as part of the Dissolution of the Monasteries and only the Abbot and one monk were granted a pension. In 1561 Elizabeth I gave the abbey and its grounds to Sir Henry Radcliffe along with a portion of ale, called the Mary-gallon, out of every brewing in Cashel. The Abbey is immensely peaceful and its nooks, crannies and the old gravestones have a gentle appeal. It seems that not many tourists trudge over to see the Abbey as it is markedly less overrun, just watch your feet as the field is used for grazing cattle. 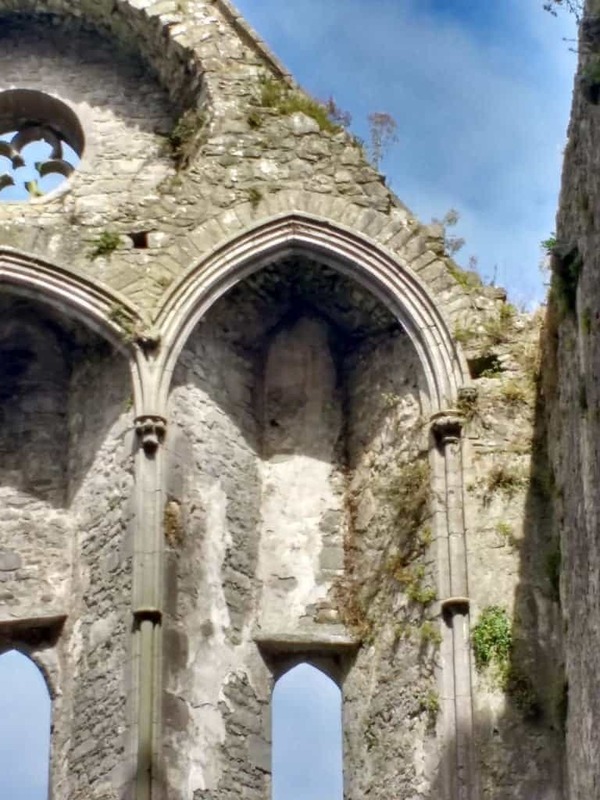 There is no entry fee to the Abbey but there is also no parking nearby so you walk to Hore Abbey from Cashel the village or the Rock of Cashel. 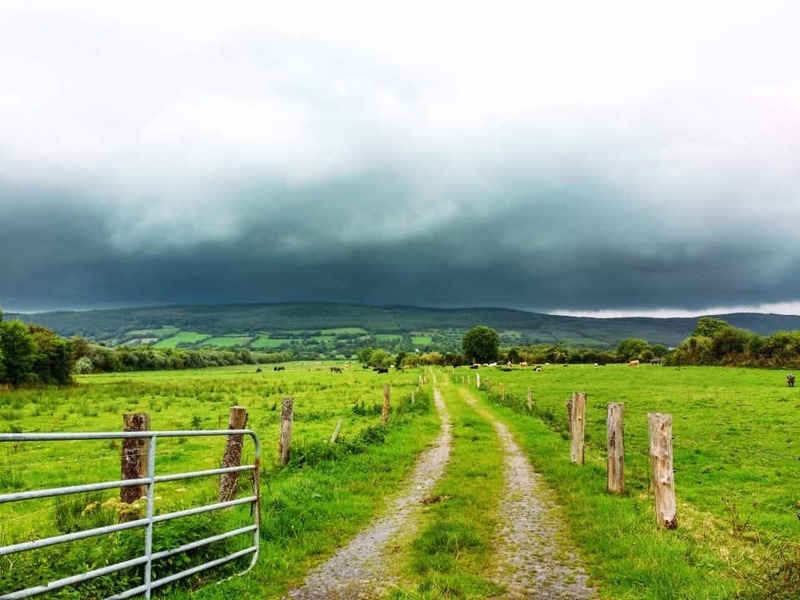 It’s not a long way to Tipperary – here are all the places in Tipperary to visit. The roads around the Rock of Cashel and Hore Abbey are quite narrow and it is probably best to park in the Rock of Cashel lot which is just down from the Rock itself. You can then walk up the hill to the Rock of Cashel and from there walk downhill to visit Hore Abbey which has no parking. The Rock of Cashel has recently been refurbished and the scaffolding has come down. 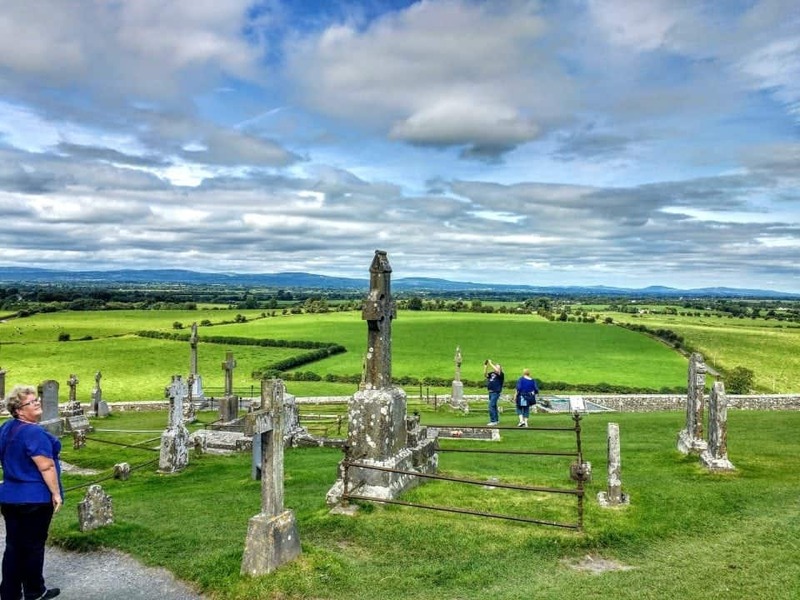 Here’s a great tip, have lunch or breakfast in the Village of Cashel and if you spend more than $15 euros you can get a coupon to enter The Rock at no charge.